Rural War Room & Theramina - "Blockhead" from the CD Not Necessarily Beautiful But Mutated Volume 10 is finished. Mastering in Pardubice, Czech Republic by Moimir Papalescu completed. Track delivered. This is very exciting for all of us. Thanks for all of your support on this, our 4th recording for this annual release. Follow us on Facebook & Reverb Nation for previews in about a week. The cyberband Rural War Room is available on iTunes. 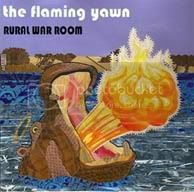 RURAL WAR ROOM-The Flaming Yawn recorded in Italy, Czech Republic, Japan and the USA. Click the cover to order - $16 USD postage paid within the continental USA. • Outside the USA Paypal for $20 USD postage paid. Our radio broadcast, Rural War Room Radio, specializes in the most rare of vinyl records and imports, at least four hours per week. • Click here to listen to our stream live weekly! Please get the new RWR Records release with Little Rock icons Elton and Betty White - UPDATE 2011: Elton White has a new ukelele. He is thrilled that there is such interest in the music he recorded with Betty in Arkansas in the 1980s. Currently, Elton lives in Venice and is helping Jerry Colburn and Donavan Suitt make a documentary about his life with Betty, his music and his current situation in Venice, California. • Rural War Room Records Recording Artists. Other Rural War Room Records artists include CC and the Fossiles, El Barak, Grieve, The Miracle Sisters, Jack Pardon, compilations The Queen Is In The Closet, 78 Record Party, We Like Crazy Music and more.